Allar Zerspanungstechnik specialises in the production of plastic parts for various industries, including the medical sector. The company uses Cellro’s Xcelerate in combination with a CNC machine from Haas for production purposes. The automation solution is deployed for a five-axis milling machine, enabling automatic performance of five-sided operations. The primary motivating factor behind this automation is Allar Zerspanungstechnik’s lack of qualified staff. Automation is intended to spare skilled staff from the need to perform routine tasks, enabling them to concentrate on the production of smaller series and unique items. That’s because Xcelerate handles large-scale series production. Allar Zerspanungstechnik determined that using Xcelerate for these series increases the number of spindle hours, allowing the company to produce more parts each day. Allar Zerspanungstechnik chose Cellro’s Xcelerate due to the high storage capacity of its large drawers. The high machining volumes made this an essential requirement. Plastics machining is subject to relatively short processing times compared to aluminium or steel. 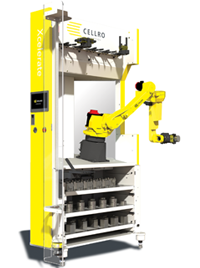 Therefore, to be able to deploy the loading robot productively for longer periods, there needed to be sufficient storage for both completed and unprocessed products. Working with Cellro proved to be highly satisfactory. “We found the installation to be a pleasant surprise. The technician who took care of it was very well trained and even taught us a few things. Support and customer relations are also well-conducted and proactive,” says Frank von Schwartzenberg, production manager at Allar Zerspanungstechnik. What has automation resulted in? Automation has led to Allar Zerspanungstechnik delivering more orders than usual, and has resulted in a satisfied company. The team is pleased with how well Xcelerate supports production. The staff at Allar Zerspanungstechnik is spared the more tedious jobs, as these are now handled by the robot.